The Twin in Berlin: I Know I Say This All The Time But Sundays We Really Eat Like Queens. I Know I Say This All The Time But Sundays We Really Eat Like Queens. This week was pretty good. Mostly. Tuesday we went to a member's house, and she invited a long time friend who was also really cool. It was one of those eating appointments where we were expected to eat A LOT. Ohhhh man. I walked in and saw the table full of hot food (and it was pretty hot outside, let's not forget) and I just didn't know what to think. BUT it was reallllly gooood and then we had a solid discussion about prophets and God's love. They are both really funny German ladies. Wednesday we went to this past investigator's place and turns out she is a learned native American healer.... So very soon after we entered it became clear that her opinion wouldn't be going in a more specific direction (from what she said and just from what was around) however, we had a solid conversation about Jesus and faith. One of the greatest things I've learned on the mission is patience. Soooo many times I just wanted to interrupt her, tell her she was wrong, say something about our nothingness in comparison to the wisdom of God, etc etc. buuuuut I didn't. It was hard. But people have their own right to believe what they want to believe. If they allow themselves to be touched by the spirit, then it happens. But if not, I shouldn't try to force it on them. naja. Later we met with Holger!! We went through the restoration, he was pretty enthralled and just kept asking what came next. When we cleared it all up and gave him the Book of Mormon, he got just a bit apprehensive, as he has already found his own way to Jesus through energy. But he said he will read and pray about it. 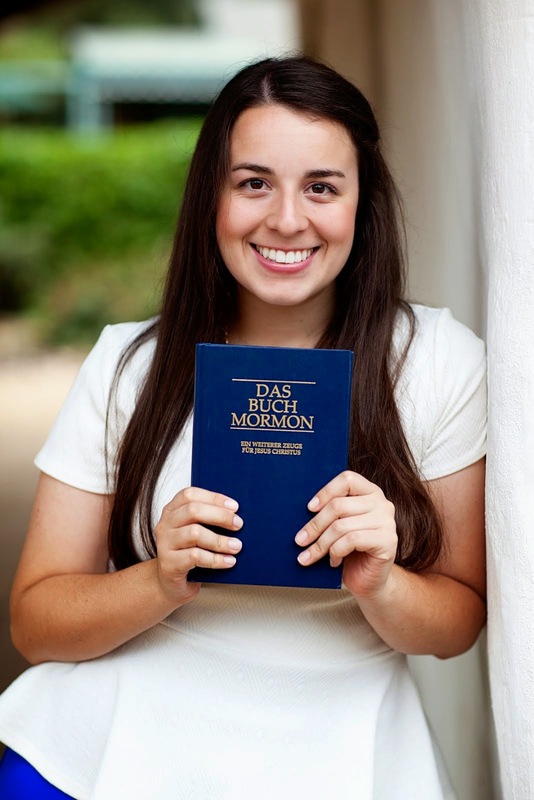 We shared our testimonies that the Book of Mormon can be used by every single one of us on the earth, EVERYONE. I love that about the restored gospel. I know that it can touch the hearts of us all. Thurs I wasn't feeling well so we stayed home and slept for a few hours. We got to meet Elder White, Elder Clarke's new companion! He is really nice. I'm excited that he can start his mission here. Friday we had a cool district meeting. Sister Reed and I gave a thema on member appointments. There are often things that we can't control, if they like us or not, if they chatter too much, etc but if we listen to the promptings of the spirit and do OUR part according to the Spirit, then it will be good. Saturday we had to add sister Gebhard (sister from the other ward) to our companionship, as her comp wasn’t feeling well and went to stay with a member. We all went to a lesson with one of their investigators, and the guy was telling us how important it is that we do this, that we approach people in the street and try to tell them about God's plan for us. That was tender to hear. Sunday we ate at the previous bishop's house with his wife. They are an older couple. Meat. Potatoes. Rotkohl. Soße. EIS. need I say more? IT WAS SOOOOOO GOOOOOD. I know I say this all the time but Sundays we really eat like queens. (I miss being home.) Then the bishop took us outside and got on a little ladder and picked apples from their apple tree to give to us. hahaha I was hoping the little man wouldn't fall off! Madison helping the Bishop pick apples! naja. This week lacked some enthusiasm on my part, and I think my attitude was a bit of a downer. Sometimes there are those moments where I realize that I am feeling down, but I don't do anything about it. I let myself stay wilted. I think these feelings come from not seeing the worth of our efforts, or just thinking that I am not capable of doing good here. In my mind I know that's not true, but in my heart it's harder to feel that it's important. My goal for this week is to stay enthusiastic. How will I do that? I'll tell you. By thinking of my love for the Savior. He has asked me to be here, so I will stay here. This is his work, and I love Him. Easy solution. Have a reallly gooooood week.